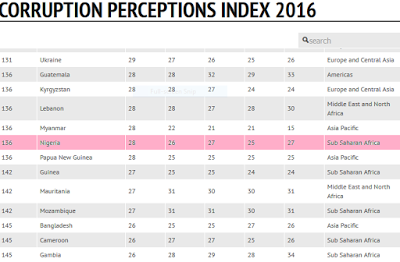 Despite the anti-corruption war by the government, Nigerian has retained it's 136th position in the Transparency International’s Corruption Perceptions Index 2016. Nigeria is sharing the position with Lebanon, Myanmar, Guatemala, Kyrgyzstan and Papua New Guinea. 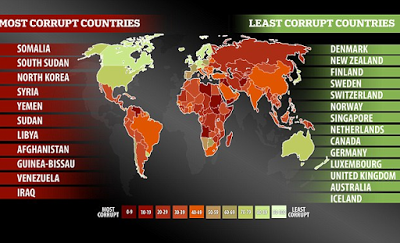 Denmark, New Zealand and Finland were ranked 1st, 2nd and 3rd least most corrupt countries which North Korea was ranked as the most corrupt country followed closely by South Sudan and Somalia. 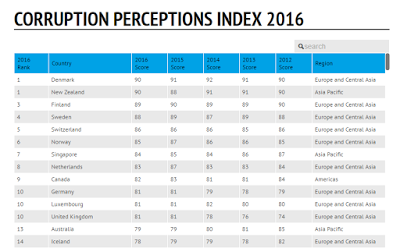 According to the Transparency International, More countries declined than improved in this year's results, showing the urgent need for committed action to thwart corruption.